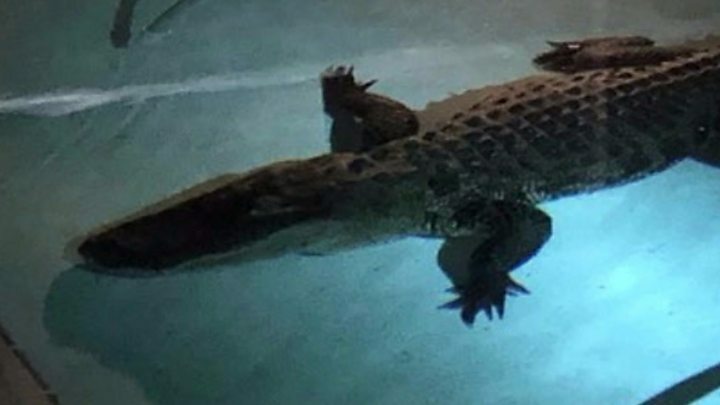 Florida police have posted photos and video of an 11ft alligator in a family's swimming pool, along with the words "Just no". Residents in Nokomis called for help after discovering the animal. The Sarasota County sheriff's office posted film of a trapper dragging the animal from the water on Saturday. Responding to their own tweet, the officers said the gator managed to "bust right through" a screen door to get to the pool. Officers posted with the hashtags "Tweet from the Beat" and "Only in Florida". The American alligator on average grows to between 11 and 15ft long, and can weigh up to 1,000lb (454kg). The creatures are native only to the southeastern USA and China, in contrast with crocodiles, which are found in many parts of the world. Most US alligators live in Florida or Louisiana, with over a million in each state. Although classed as endangered under the US Endangered Species Act in 1973, conservation efforts boosted alligator numbers and the animal was removed from the list in 1987.